Belk | Lucy is pleased to present the exclusive leasing opportunities for the outparcels at The Market at Cane Bay. 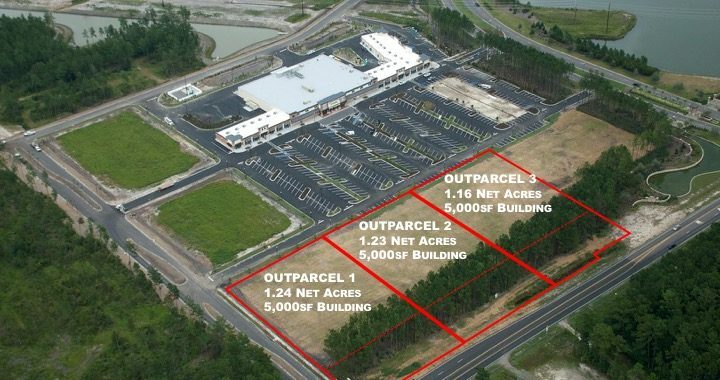 Two outparcels are available in this Publix anchored shopping center, each of which can accommodate up to a maximum of a 5,000 square foot free standing building. The center is located at the intersection of Highway 176 and Cane Bay Boulevard and the entrance to Cane Bay Plantation and is directly across from Cane Bay High School one of the largest high school campuses in South Carolina. Cane Bay Plantation was the 13th best-selling master-planned community in the US in 2017 with 584 homes sold. It also earned its ranking as #1 top-selling community for the last five years in the tri-country area as well as in the state of South Carolina. At capacity, this community will house roughly 13,000 homes. Offering convenience, top-rated schools, and numerous amenities, this well-established and fast-growing community is an excellent opportunity to join other successful area businesses.